Campaign to save the NHS! 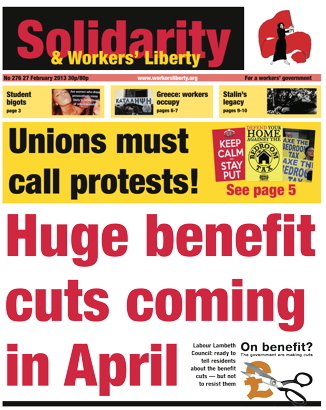 Benefit cuts: unions and Labour must protest! Slavery in the US: liberation from above? Can You Hear Them Marching? London hospitals are failing patients who need emergency care, according to a just-published NHS audit (researched undertaken in 2011). According to the audit none of London’s 28 Hospital Trusts are meeting minimum standards. The report is published as an inquest takes place into the death of seven week old Axel Peanberg King who died of pneumonia despite calls and visits to a privatised out-of-hours GP service based at the Whittington Hospital in north London. Italy’s general election has produced a stalemate. The electoral coalition headed by the Democratic Party’s Pier Luigi Bersani has failed to get a working majority. The populist Five Star Movement has done well. Writing before the result, Hugh Edwards looks at the background. 150 people demonstrated at London Metropolitan University (LMU) in solidarity with victimised trade unionists Max Watson and Jawad Botmeh as they faced a hearing on Monday 18 February. Max and Jawad, who are activists in Unison, are suspended from their jobs because of alleged “gross misconduct”. When I first entered politics, I used to respect George Galloway, he was one of few prominent politicians with a viewpoint that seemed to resonate with my own. I liked the way he could run rings around ignorant TV presenters; his eloquent and devastating oratory gave comfort to me that my anti-Iraq-war feelings weren’t either as isolated, or as naive as every analyst made them out to be. Stan Weir (1921-2001) was a Third Camp socialist, trade union militant and intellectual at the forefront of the post-Second World War US labour movement. Weir graduated from high school in 1940 and, because of his school’s participation in an experimental curriculum, was eligible for a place at the University of California. Neither Stan nor his classmates were told of this, however. The omission was no accident. As his former principal explained, kids from his school were needed as mechanics and factory workers, not college graduates. The struggle of workers at the Industrial Mineral (BIO.ME) factory in Thessaloniki is one of the most important workers’ struggles taking place in Greece. Tuesday 12 February marked the first official day of production under workers’ control at the factory. The workers are posing the issue of workers’ self-management as a response to “padlocks”, layoffs and a bankrupt capitalist Greece. Workers’ Liberty has always been committed to debate. Not “debates” in the sense of one-sided denunciations of straw-men opponents with no chance for them to reply, but genuine debates — in writing or in person — between opposing viewpoints. We are committed to debate within our own organisation, within the left, and between left and right. That’s why, in 1992, we debated Roger Scruton and David Marsland, ideologues of the “New Right” proclaiming the death of socialism. That’s why we carry internal debates in our public press. A scattering of protest meetings and stalls and lobbies is beginning to grow. The TUC has called a rally for 13 March. The Labour Party has at least voted against the benefit cuts — it hasn’t voted against all the bad things the coalition has done — and some local Labour Parties have campaigned, with official approval. Sacha Ismail is wrong, I think, against Eric Lee (Solidarity 274). Sacha doesn’t like Eric’s basic point — that the US slaves were liberated “from above” by a white man, using a “white state”. Of course liberation would have been better coming from the action of the slaves themselves, rising in armed revolt and winning their own freedom, arms in hand. Abolition won this way — and the self-confidence and self-organisation gained — would have made the racist counter-revolution of the 1870s onwards much harder to carry through.